1-	Wearing old dirty shoes. Let me face you with this fact, wearing dirty worn out shoes takes the crown among all fashion mistake you could commit. People do notice a pair of shoes that should have been recycled long ago before anything else. 2-	Shirts and vests with exaggeratedly big V necks. The shirt will show your chest hair (but not in the way it should be shown). The vests, on the other hand, will need buttoned shirts to be worn under them, making you look like a character from some 50s TV drama. 3-	Becoming a billboard for brands. Making whatever you wear carries the logo of one brand or another is a deadly male fashion mistake. And just for your information, most people know (including you) that big brands don’t show their logos on their products, at least not prominently. 4-	“leather-ing” up clothes. Really, no need to kill an extra number of animals just to wear things in leather. Besides, next to a leather jacket, what do you really need leather for? You don’t carry a bag, leather gloves are not practical, and leather trousers?…no! 5-	Giving up shoes, in other words, wearing sandals all the time. If you don’t know this already, then here it is, sandals need a certain surrounding such as the beach, and they are not formalwear, so they aren’t suitable for most of your daily activities. 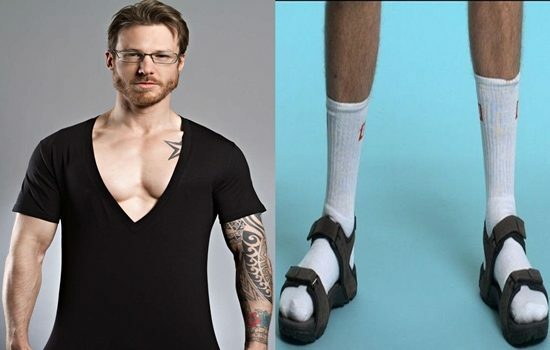 6-	Wearing sandals while you have socks on. If sandals needed socks, they wouldn’t have designed them the way they were designed. If you are wearing socks, then ditch the sandals. As simple as that. 7-	Tossing your clothes around like a 4 year old once you get back from any outing. Please act like a civilized human being, and hang your clothes neatly in your wardrobe. Both your clothes and those who are living with you would appreciate it.